February. It’s a month that’s traditionally focused on love and relationships. But for older adults, maintaining relationships can be difficult. Often, they’re coping with the loss of a spouse or partner, shrinking social circles or family they can’t easily visit. Aging in place often means living alone, and older adults who live on their own without regular human interactions can feel isolated. That’s why some seek to form relationships with peers who have similar interests. This may be as simple as finding a casual friendship or someone to meet for a recreational activity. Or, sometimes, it could mean dating and even marriage. Aging in place doesn’t have to be lonely. And finding ways to maintain relationships throughout the years can have lasting benefits. No matter what your age, strong personal connections and deep human bonds are essential to happiness and emotional wellbeing. According to the Mayo Clinic, meaningful friendships can also be good for your health, reducing the risk of high blood pressure and an unhealthy body mass index (BMI). Numerous studies, including this one published in the American Journal of Public Health, suggest that older adults with larger social networks experience better cognitive health and have improved memory. And they even live longer than their peers with fewer social interactions. Pursue a hobby. Join an art class, cooking group or book club. Stay fit. Try a bowling league, walking group or dance lessons. Have faith. Make connections at your place of worship. Check out a senior center. Many offer a variety of activities geared to different interests and designed to bring people together. Volunteer. Share your time with a worthwhile cause in your community. Creating and maintaining new friendships takes some initiative. And it might require you to step out of your comfort zone. But the results can be rewarding and can truly enhance quality of life for older adults. Another way for older adults to enhance their social networks is by reconnecting with old friends with whom they’ve lost touch. It’s not unusual for people who were once great friends to just pick up where they left off, no matter how much time has gone by. These are often people – former classmates, neighbors, co-workers – with whom you already have a connection through shared experiences or similar interests. And don’t forget about cherished family, too. When was the last time you invited your favorite cousin for a visit to reminisce over old family photo albums? Or enjoyed a recreational activity with a former partner-in-crime? Reuniting with friends and family from your past can make you happier today. Some older adults might be looking for a more significant relationship. 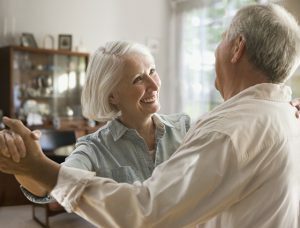 If you’ve been widowed or divorced, maybe you’re longing to make a romantic connection, to find someone with whom to spend your golden years. Some people see this time in life as a second chance for love. That may mean reconnecting with past partners or finding loving companionship with a friend who is also widowed or divorced. Those who are not sure where to start looking for love sometimes turn to online dating websites geared specifically for older adults. If you rely on the Internet to make a connection, however, beware of red flags that can signal someone isn’t truly interested in your affection. Regardless of whether you’re looking for love or simply looking for a friend or companion, making connections and nurturing fulfilling relationships is as important in your 60s, 70s, 80s and beyond as it was in your youth – if not more. Opening yourself to new human connections can start with something as simple as a regular visit with someone who can share a conversation and provide a listening ear. This month of love and relationships could be a great time to reconnect, expand your social circle and seek out the companionship that will enhance your quality of life as you age. FirstLight Home Care’s Companion Care Services can enhance quality of life for older adults by providing regular visits, conversation and company to seniors in need of social contact. Sometimes all it takes is a friendly interaction, shared mutual interests and kind gestures to bring joy and comfort to an older adult who’s aging in place. Let’s make a connection. Find a FirstLight location today. It could make them boost their motivation to live and enjoying the moment of their lives.